So yesterday Business Insider posted a nifty-looking chart that claimed Japanese readers would be spending the most on ebooks this year, followed closely by Brits. 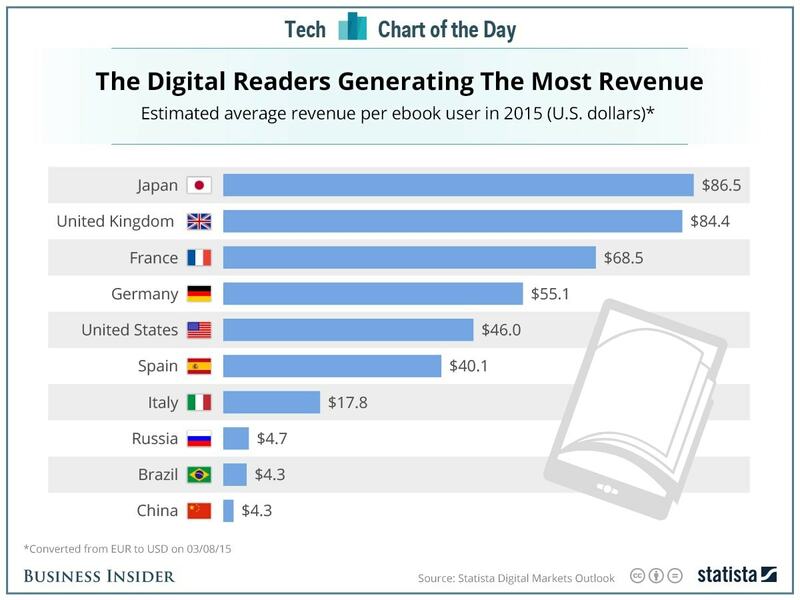 As you can in the chart at right, the Japanese will spend an average of $86.50 on ebooks. eBook users in the UK are expected to spend $84.50, and Americans were expected to spend a mere $46 per ebook user (click on the image at right for more details). If true, then this would be a fun little factoid, but before I posted this story I decided to look into the research used to make the chart. Yep, there was no research, nor was any other data supplied to back up the claims in that chart. Furthermore, I could not find any info on the Statista website which explained where the data came from or how Statista arrived at the predictions made in the chart. Update: That finder's fee goes to Russell Phillips, who noted that there was a chart that detailed ebook penetration by country and another chart that showed the estimated ebook sales by country. Not sure where BI got its population figures, but that does explain where some of the data came from. With that in mind, I have to conclude that this chart is, at best, completely unsubstantiated. That makes it clickbait, and I plan to ignore it. Aldiko Plans to Release Reading App for iPad, iPhone. The revenue tab says that the US will spend $4,956,300,000.00 and that it has a penetration of 34.4%. According to Google, the US population is 318,900,000. That’s 109,701,600 readers, or $45.18 per reader. That chart doesn’t appear to have figures for Japan, but the UK figures come to $84.24 per reader. Thanks! I’ll take another look. I found the data for Japan and the other countries (it’s in the map) but I’m having trouble making the math work out. For Japan, I got $90.24 per person, not the $86.50 mentioned in that chart. I wonder where BI got their population figures? I also wonder where Statista got their data. I try to ignore Business Insider articles for a while now. They are either poorly written, have little to no sources or are copies of others’ content. I would have done the same but this piece had already been linked to from a number of sources. That put it in the category of something I had to comment on. I’m pretty sure you can generate a similar table by dividing reported trapub ebook revenue in those countries by an estimated number of ebook buyers. The biggest clue is the ranking of France and Spain as comparable to the US and Japan at the top. There are rough estimates available for both but by relying on tradpub revenue and normalizing on a per user basis they throw out the really important data: market size, changed buyer behavior (US and UK readers pick up lots of legally free titles, other countries rely more on piracy), Indie publisher penetration, and ebook pricing. In other words, the data might theoretically be defensible but it is also totally worthless. They threw away the meaningful information. A more meaningful chart might list average ebook consumption per capita, nationwide. Or, actual number of ebooks bought. Or even total ebook spending from all channels. I think both money spent and ebooks read are valid things to measure, although some people will only be interested in one or the other. I suspect you’re right about them ignoring indie books, though, and by doing so they’ve not presented an accurate picture. I think a lot of analysts haven’t yet realised how big the indie market is. They probably ignore it, assuming it’s too small to be of any interest. And since it is mostly non-existent in the under-developed markets it skews the normalized spending. Any chart that shows a $5B market as less profitable than one two orders of magnitude smaller is meaningless. Indeed. This chart really should have been a mapping of coordinate pairs (readers, amount spent). That would have been more useful. Although it wouldn’t fix the underlying issues. Dollars spent per reader is a poor way to compare countries in any case. EBooks read per reader is a much more interesting number, especially if you can count free books from promotional give-aways and “free” eBooks borrowed from public libraries. Yes. The dollar value doesn’t take into account market differences like currency, local ebook prices, etc. But if we counted units read, that would give us a better idea of which markets were the most active and the relative sizes.